Why Is Inpatient Alcohol Rehab the Right Choice for Me? When considering your treatment options for an alcohol use disorder (AUD), you may come across a wide variety of programs and offerings. Various factors such as medical history, length of prior alcohol use and frequency of drinking will play a role in what form of treatment best fits your needs. Sometimes, if the warning signs of alcoholism are caught in the early stages, an outpatient setting may provide sufficient treatment. This allows you to carry on with daily activities such as work or school, family obligations and other responsibilities. However, if you have struggled with years of heavy drinking, an inpatient treatment center may provide the best recovery options. Inpatient rehab is one of the most common ways to treat an AUD. It involves checking into a rehab facility and staying there for the duration of your treatment. You will have access to medical professionals and other specialists 24 hours a day, allowing you to rest easy knowing help is always available. Additionally, inpatient rehab programs have a set schedule which consists of breakfast in the morning, followed by therapies, counseling sessions and activities for the remainder of the day. Individuals over the age of 60 tend to struggle more during the detox phase. The painful withdrawal symptoms can lead to various health complications and may be life-threatening if not treated properly. An inpatient treatment facility will offer the special medical care that seniors need in order to overcome a drinking problem. A person suffering from alcoholism and a co-occurring mental health condition may require a personalized treatment plan. Inpatient rehabs have specialists on site who will be able to treat both conditions separately. Counseling sessions will teach the individual how to cope in various real world situations and prevent falling victim to triggers. Mixing drinking and drugs can lead to extremely dangerous interactions. A person who wants to overcome a substance and alcohol abuse problem should seek professional medical help. Treatment specialists are able to monitor health conditions closely, relieve any uncomfortable withdrawal symptoms and provide assistance through each step of the recovery process. Inpatient treatment is often highly recommended for people with a medical history of heart, breathing or liver problems. If any part of the recovery process interferes with a medical condition, treatment specialists will be able to make the necessary modifications. A person’s health can impact what medications are used and their overall treatment plan. Inpatient alcohol rehab typically involves 30, 60 and 90-day programs depending on the severity of an alcohol use disorder (AUD) and how much a person drinks. 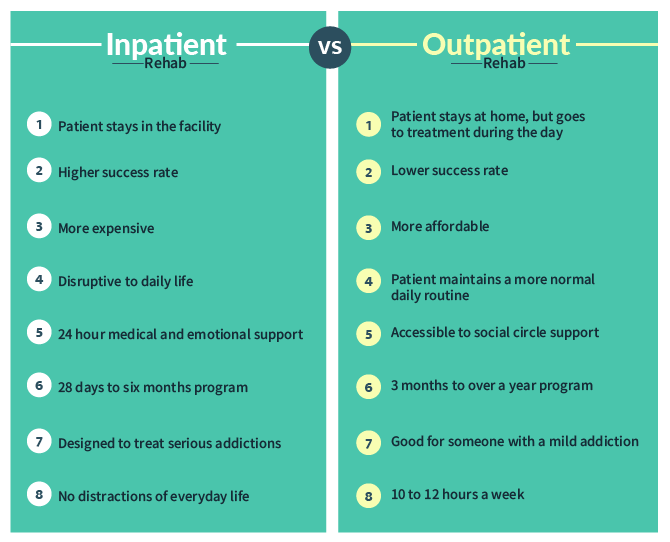 The cost of inpatient rehab varies based on location, amenities provided and length of time in treatment. However, many facilities accept different forms of insurance or offer financial assistance to those in need. A person can seek treatment close to home or out of state. Out-of-state rehabs provide many advantages such as distancing you from triggers and allowing you to focus solely on getting better. There are two primary types of inpatient alcohol rehab programs: inpatient residential rehab and partial hospitalization. Your doctor may recommend one type of rehab over another based on the severity of your alcoholism, how long you’ve used alcohol, your financial situation and other considerations. Before making your decision, weigh each option by thinking about its benefits, the types of therapies offered, the duration of the program and if financial assistance is available. Inpatient residential rehab facilities typically offer 30-, 60- and 90-day programs. You will be required to stay on site during your treatment. As this is the most intensive form of treatment, it proves most successful in helping those with severe alcoholism. Your first week in an inpatient residential rehab will generally include detox, the first stage of the recovery process. This eliminates alcohol from your body entirely so you are no longer under the influence of its effects. Afterwards, you will continue on in the recovery process with a structured daily schedule of therapies that will teach you how to overcome alcoholism and maintain long-term sobriety. A partial hospitalization program is a cross between inpatient and outpatient treatment options. It can be as intensive as a full hospital setting, but partial hospitalization programs allow you to be home every night. This treatment option works best for people who live close to the facility and have a stable home environment. While the frequency of treatment in a partial hospitalization program varies, many programs run every day and last between six to eight hours. Even though individuals are able to go home each evening, they are still closely monitored for signs of a potential relapse, withdrawal symptoms and other health conditions. The length of time for inpatient alcohol rehab varies by person. The shortest program at many treatment facilities is 30 days; however, some individuals need additional time and stay for several months. Other rehabs may allow you to complete the detox process on site and then switch to an outpatient facility afterwards. Individuals with less severe forms of alcoholism may choose a shorter inpatient program as a way to eliminate any daily distractions or triggers. After completing rehab, they can continue recovery maintenance by attending local support groups, like Alcoholics Anonymous and AI-Anon, or meeting with an alcohol counselor. It takes a huge commitment to not fall back on old habits once they get back to a daily routine with challenges and stressors. Treatment may take longer for those who have suffered from years of alcoholism. This is due to the effects that alcohol has on the body. Heavy drinking begins to rewire and restructure how the brain works. It also gradually begins to affect other major organs such as your heart, lungs and liver. Once you quit drinking, it takes time for your body to get back to a normal state. Regardless of how long it takes to complete an inpatient alcohol rehab program, treatment is always an ongoing process. Each day, you’ll need to apply the tools and techniques that you learned in rehab to various situations. Just because you’re done with rehab doesn’t mean you won’t face challenges on your journey to long-term sobriety. Take your life back by getting started in a treatment program today. When researching inpatient rehab options, you will discover a wide variety of treatment centers available. Before deciding on one, consider what’s most important to you during your recovery process. For instance, some inpatient rehabs come with basic rooms, the bare essentials and a few amenities. However, if you’re looking for more specific types of therapy or certain amenities, you should narrow your search to include what fits your needs. Is the program licensed and accredited in the type of treatment I’m looking for? How long is the program and what should I expect from treatment? Does the program offer the specific types of therapy and activities that interest me? What is the program’s success rates within one year, five years and 10 years after treatment? Will your treatment specialist help transition you into ongoing maintenance programs after completing rehab? 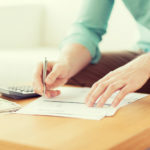 Does the facility accept insurance or offer other options for financial assistance? Will you be able to contact loved ones during your stay (phone call, email, etc.)? What types of medical specialists are on site? Do they provide 24-hour care? It’s time to get the help you deserve and kick your alcohol use to the curb. Your future is in your hands. Start on your new path to a healthy, rewarding and alcohol-free life. Speak with a treatment specialist now about top-rated recovery programs. Carol is the lead writer for Alcohol Rehab Guide. She is passionate about helping people who are struggling with alcohol abuse and addiction. Her past experience in the medical field has led to a deep knowledge of the struggles facing those with a substance use disorder (SUD), and a desire to do something to help.